Volvo Construction Equipment is adding to its E-Series compact excavators in North America with the launch of the ECR18E and the EC20E. The EC20E comes with a range of significant performance gains versus the D Series model it replaces, while the ultra short-swing ECR18E is an entirely new addition to the Volvo lineup. “We listened to our customers’ needs and improved upon our popular D-Series with updates that make the EC20E more productive, more versatile, more durable and easier to maintain. 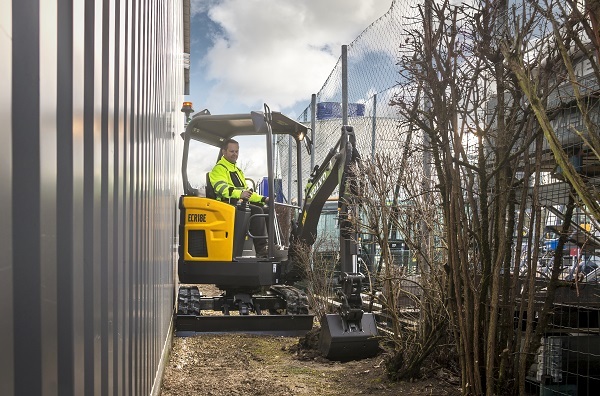 We’ve also seen growing demand for a short-swing model in this compact class — particularly in the rental market, which our new ECR18E is well-positioned to serve,” said John Comrie, product manager, compact excavators at Volvo Construction Equipment. Low height, variable undercarriage: At 79 in. tall and only 39 in. wide with the undercarriage retracted, the E-series models can fit nearly anywhere. Once in position, the undercarriage extends to 53 in. for excellent stability.